Grainger Public Relations » Role Reversal for Dundee Community Group’s Oor Wullie Project! Role Reversal for Dundee Community Group’s Oor Wullie Project! A Dundee charity, whose members have previously enjoyed Dundee Science Centre events, reversed roles recently, by evolving from the participants to the experts! Karen McAulay, Ashley Wallace (Advocating Together Dundee) and Paul Strachan (DSC) with the model Oor Wullie that is taking a trip to the edges of space in a weather balloon. Credit: D C Thomson. ‘Advocating Together Dundee’, who were involved in the planning of this and last year’s Dundee Science Festival through a number of focus groups, took part in the ‘Out of this World!’ event at Menzieshill Community Centre on 2 November. 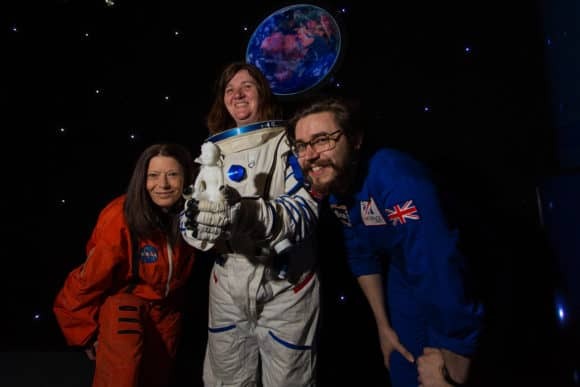 They delivered a session on their High Altitude Balloon project – a mission, which they have worked closely with Dundee Science Centre on, to send a high altitude balloon to the edge of the atmosphere with a mini Oor Wullie on board. Nearly 100 members of the public attended the event at Menzieshill Community Centre. Through its Community Engagement Programme, Dundee Science Centre offers bespoke learning experiences for the community, offering tailored activities, outreach visits and projects to suit community groups’ interests – from fun science for children’s groups, to adult learning activities. Advocating Together Dundee has been running as an Independent Advocacy Organisation for over 20 years. The charity aims to defend and safeguard people with learning disabilities, Autistic spectrum disorders and complex communication needs, providing them with a stronger voice to access the most suitable information they need to make real choices and have as much control as possible over their own lives. Now in its eighth year, Dundee Science Festival ran from Saturday 28 October through to Sunday 12 November 2017, with over 30 events designed to entertain, inspire and fascinate, most of which were free of charge. Dundee Science Festival is brought to you by Dundee Science Centre, an independent charity. For more information about Advocating Together Dundee, visit http://www.advocating-together.org.uk. For more information about Dundee Science Centre’s Community Engagement programme, visit http://www.dundeesciencecentre.org.uk/learning/community-engagement/.